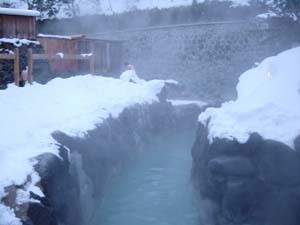 Probably the most famous onsen in Kusatsu, Ootaki no yu is well-known for 'awase yu,' a traditional bathing style in which people soak in baths at different temperatures, in the dimness of an underground room. Be aware that the temperature of the baths can be unbearable, starting at a hot 42 and reaching up to 46 degrees Celsius! A rotenburo is also available, but is reserved for men. Segregated baths can also be found in a different part of the building. The baths are rather small - they are comfortable for only 2-3 persons, but there are about six of them, plus some onsen showers. If you want to stick to not-too-hot water, your choice of bath will be limited though! In this old-fashioned building, completely made of wood, almost only the steam of the hot water can be seen, which makes it easier to share the bath with other men/women. However, especially shy women will take advantage of the 'women only' periods, which three times per day banish the men from this bath. Kusatsu area attracts visitors all year round. In Summer, the Kusatsu-Shirane volcano is a must, with its extremely acid, emerald-green crater lake; visitors are not allowed to reach the shore of this lake, but are offered a breathtaking view on it. In winter, Kusatsu transform to a lively ski resort. People spend then their time between the ski fields and the onsen. In the middle of the town, the Yubatake is a natural system for cooling down the onsen water, which flows at 5000 liters per minute! In Kusatsu, some 20 free public baths, usually small, can be found. We gave to this onsen the medal for the best natsukashii onsen - meaning the bath provide a feeling which was probably very close to that enjoyed by people 100 years ago - for its famous, old inside baths. The first time I went and soaked there, I really felt like a gaijin in Japan. Try it - you will understand, and still enjoy the feeling!